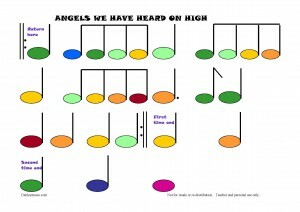 The colours on my version of ‘Angels We Have Heard On High’ are taken from the set of Aldi bells I purchased about a year ago. The bells are numbered, so you may prefer to number the notes before you laminate the bell music. 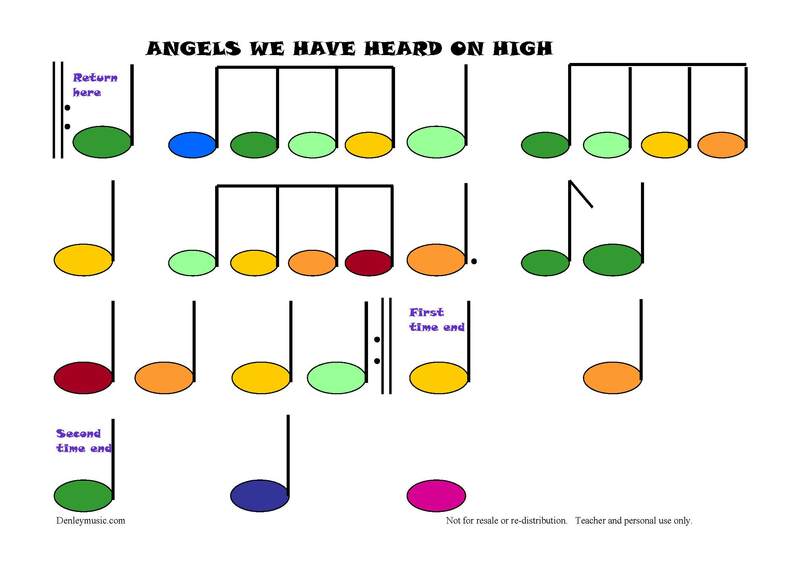 You can also just use the second page if you prefer the ‘chorus’ only (and yes, the quavers are the smaller noteheads). Unfortunately at this point the crotchets and minims look the same. The kids I’m doing this with won’t be able to tell anyway. I will be pointing along to the notes as the children play them. Edited to note: My printer decided not to differentiate between the dark blue and light blue, so you may need to write in “LB” (Light Blue) and “DB” (Dark Blue) if your printer does the same.